I mentioned last week that I’ve been dumbing down my meals lately. No casseroles, no dishes that require additional assembly. Stick with grilling meat, roasting veggies, slicing up some nice bread (bonus points for homemade). DONE. Not only do I feel like I’m eating fancy restaurant-quality food (when’s the last time you had a casserole at a restaurant? ), I’m also saving time and avoiding those extra ingredients that bring extra calories. But. But but but. Habits die hard and still, sometimes, I’m just all about a one-dish meal. The veggies, the meat, the dairy, in just one big bowl. So what to do about that? Salads-for-dinner have been my go-to for simple, light meals over the last month. Now that Mr. P’s back in school, I’m walking to and from work. And after a mile-long walk in triple-digit heat, a big, hearty salad is the perfect dinner. It’s not too hot, not too cold (Mr. P doesn’t like cold meat in salads), and the crunch makes it super satisfying. So, with my recent love for salads, I started wondering... what dishes have I made in the past that could be salad-ified? 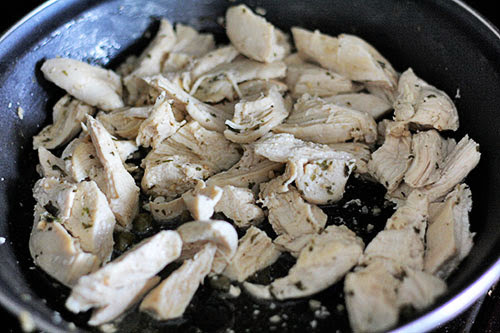 A flip through my past recipes had be brainstorming about chicken piccata, which has a lemony-wine sauce with capers. The potential! 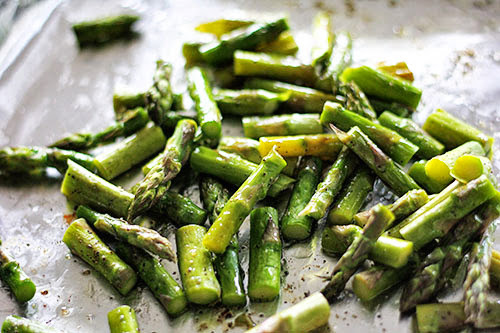 Add some asparagus and goat cheese, and you’ve got the perfect salad-ified dinner. Let’s get started! 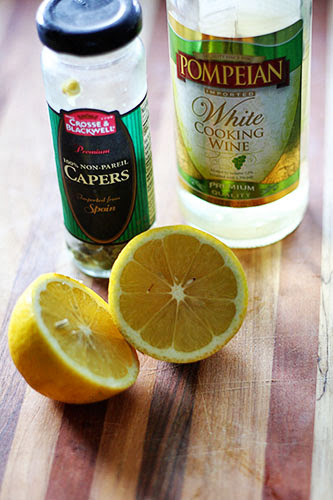 Just like for chicken piccata, you need some white wine, capers, and a lemon. 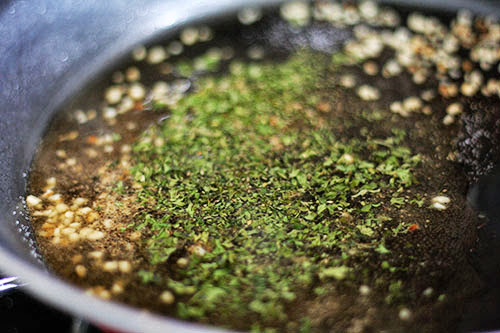 Then added parsley (LOTS), a tablespoonish of capers, and about a half-cup of wine. Don’t measure. We don’t measure around here. Add SOME. With a shallow depth of field for garlic-and-parsley bokeh! Hmm. Anyway! For turning chicken piccata into salad, you also need, well, chicken. 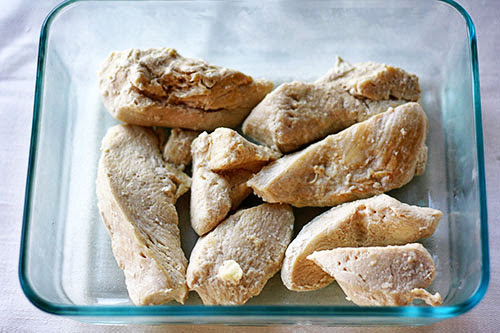 I’d already cooked this sliced chicken breast in advance, but you can start with raw, or even shredded rotisserie chicken. 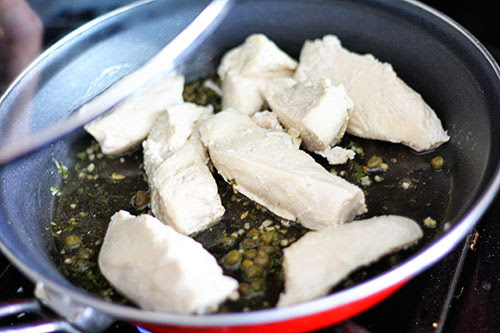 Just getcha some chicken, add it to the skillet, cover it, and bring it all to a gentle simmer (or a slightly stronger simmer if your chicken is raw). All right! 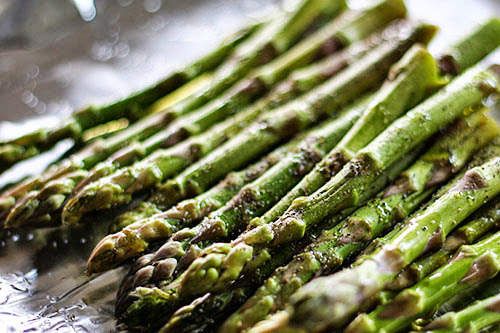 About that asparagus. It needs to be roasted with olive oil, salt, and pepper. 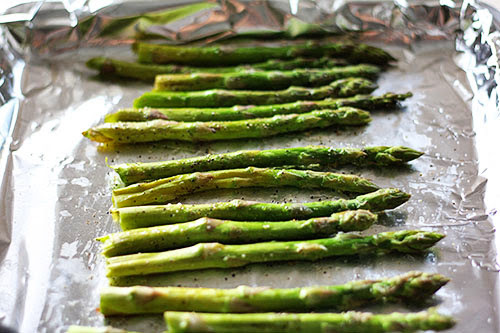 If you’re a total asparagus-roasted novice, no worries. Prep it by washing it and snapping off the woody ends (opposite the floret). Each stem will snap in just the right place, so go for snapping over chopping off the ends! Then you just roast it just like zucchini or broccoli. I usually go for 8-10 minutes at 350°F in my convection toaster oven. Add that to the chicken and lemony sauce. Mmmm. 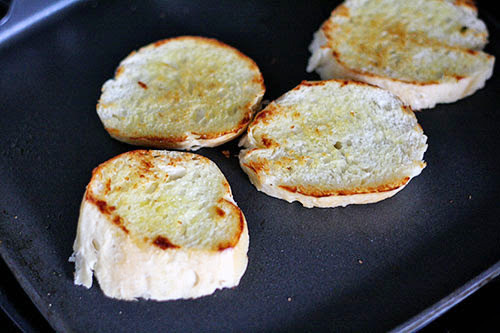 Let’s be honest, I could seriously just eat grilled bread every night for dinner. But! It’s even better to have a big bowl of greens with it. 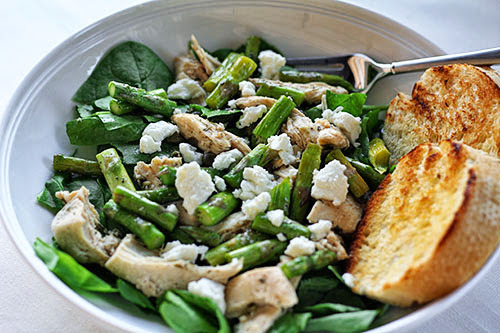 I just filled our bowls with spinach leaves, added the chicken and asparagus with the delicious lemony sauce, and topped it all with goat cheese. Oh em gee. This was so good. SO GOOD. I know it might seem weird to put warm chicken and vagetables in a salad, but don’t knock it till you try it. 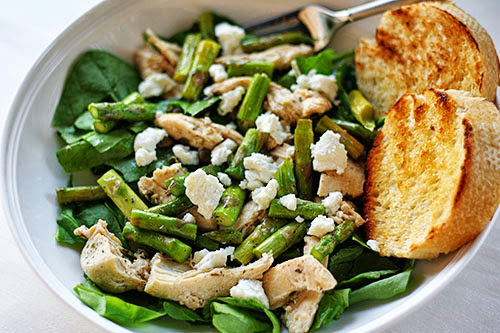 The spinach doesn’t get super-wilty because the chicken and asparagus cool fairly quickly. The warmth makes it feel just a bit more dinner-y (cold dinners leave me, well, cold). And, if you put the goat cheese directly on the warm chicken, it gets all melty and coats everything in the salad. 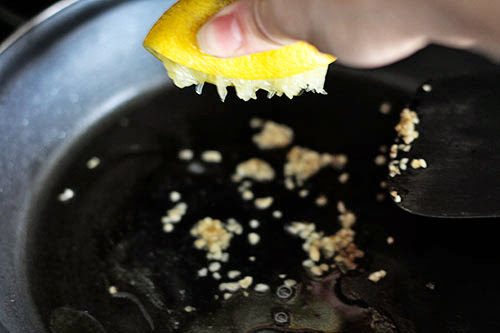 You don’t need extra calorie-laden salad dressing – toss it together, and it’s perfect as-is! With my new salad-ifying powers, I have been turning dang near everything into a salad here lately. Anything that would be good over pasta is also good over a bed of lettuce! Which makes me wonder... what meal can’t be salad-ified? This might be a personal challenge. Taco salad and buffalo chicken salad are already a thing. Pizza salad? Oh man. OH MAN. I’mma stop right there, I have to go figure out how to make a pizza salad. Friday and Saturday: I’m on the road for a conference! Mr. P will fend for himself, I’ll probably be downing Chipotle burritos by myself in my car. Dignity = overrated. 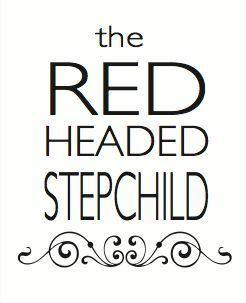 Happy Monday, dear readers! Hope your week is off to a fantastic start!